The pancreas is a part of the digestive track that sits behind the stomach along the back of the abdomen. It is around 6 inches long and releases hormones and enzymes including insulin and glucagon that aid in hydrolyzing carbohydrates, fats and proteins as they are ingested. There are several conditions that can lead to pain in the upper abdomen which may be stemming from pancreas symptoms. Pancreas pain is often described as a dull, sustained or moderate pain. It will often be accompanied by a reoccurring intensification of the pain including a sudden drill or knife-like pain that is quite unbearable. If the condition causing the pain affects the whole pancreas, it can cause a belt of pain around the stomach that reaches the lower back. Back pain is more common if pancreatitis or advanced stage pancreatic cancer is present. These conditions can also cause retching, nausea or vomiting. In some cases, eating, drinking or supine may worsen this pain, but sitting with the knees contracted and trunk bent can improve symptoms. 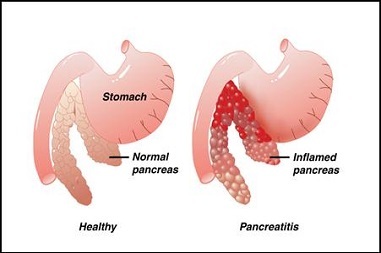 As the two most common conditions responsible for pancreas pain are pancreatitis and pancreatic cancer, detailed information of these two conditions are displayed below. Pancreatitis refers to inflammation of the pancreas. This can be an acute condition that lasts for days after appearing suddenly or a chronic condition that plagues the patient for many years. In mild cases, pancreatitis will fade without the need for treatment, but a severe case may lead to complications that can be life-threatening. The symptoms associated with pancreatitis may vary from patient to patient depending on the severity of the condition. Acute pancreatitis can cause nausea, vomiting, upper abdominal pain, pain that radiates to the back or feels worse after eating and tenderness when touching the abdomen. Chronic pancreatitis can cause indigestion, upper abdominal pain, smelly or oily stools and weight loss without trying. Pancreatitis is caused by the digestive enzymes of the pancreas becoming activated inside the organ, damaging the tissue here rather than moving into the small intestine to help break down food. This will lead to inflammation over time, eventually causing scar tissue that will prohibit the pancreas from functioning. Eventually a failed pancreas will cause digestion problems and diabetes to develop. You will often need to visit the hospital to stabilize the inflammation of pancreatitis and address the underlying issue causing this problem. Gallbladder surgery, surgery to drain fluid from the pancreas, procedures to remove an obstruction of the bile duct or addressing alcohol dependence may be necessary. Chronic pancreatitis sufferers may need to alter their diet to encourage low-fat eating. They may need to take medication to help manage the pain of pancreatitis or use enzyme supplements to help break down food properly. While in the hospital you may need to fast, consuming bland foods and clear liquids to allow the swelling of the pancreas to reduce. Pain medication s and intravenous fluids will be provided as necessary to ensure that the body has enough energy to recover. 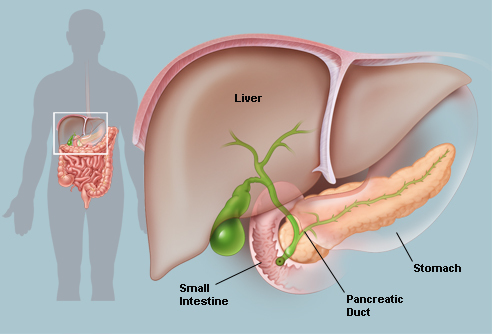 Pancreas cancer is defined as a cancerous growth that initiates in the pancreas. It can be very difficult to diagnose pancreas cancer, even with early detection which leads to this condition having a very high death rate. In many cases pancreas cancer is only discovered after it is too advanced to allow for the removal of the growth. Pancreas cancer symptoms can include weight loss, upper abdominal pain that radiates to the back, depression, yellowing of the skin or whites of the eyes and blood clots. These are typically signs that the disease has become quite advanced. At this time the causes of pancreatic cancer are quite unknown. Cancerous cells develop in the pancreas when the natural tissues develop DNA mutations. Mutated cells will grow at an uncontrollable rate and live longer than normal cells would, resulting in the development of a tumor. 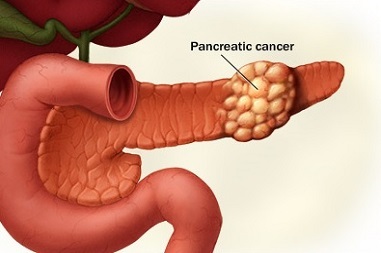 Most tumors that initiate in the pancreas start growing around the ducts, a condition known as pancreatic exocrine cancer or pancreatic adenocarcinoma. In rare cases the pancreatic cells which produce hormones can develop cancerous growths, a condition known as pancreatic endocrine caner or islet cell cancer. The treatment applied to pancreatic cancer will vary based on the stage the cancer has reached. Surgery may be used to remove the pancreatic head as well as portions of the small intestine, bile duct, gallbladder or stomach to reduce the spread of the cancer. Individual tumors, the pancreatic body and tail or the spleen may need to be removed to prevent the spread of cancerous cells as well. To kill off any remaining cancerous tissue, or to address cancerous growths that cannot be treated by surgery, targeted drugs such as erlotinib can be used to prevent cancerous cells from growing and dividing. This is often paired with traditional chemotherapy or radiation therapy that kills off fast growing cells to prevent cancerous cells from thriving.